Voting is closed. 615 users have voted. 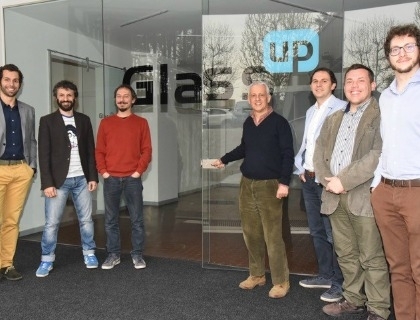 GlassUp is an Italian startup based in Modena. Since its foundation the company, has been working on the augmented reality technology. The team counts on 19 resources divided into 3 main departments: Marketing & Sales, Administration and the R&D which is the most copious. Thanks to the team’s efforts and competences, GlassUp has developed and manufactured GlassUp F4: augmented reality glasses for remote assistance and on the job training on shop floors. GassUP on social media channels: Twitter, Facebook, LinkedIn and Instagram. Thanks to the European funded project, GlassUp has been able to work on the development and integration of the augmented reality technology into F4 goggles. This process has been very complicated as it is based on the coexistence of an optical system, an electric micro-circuit, and a firmware. The optical system has been miniaturized and the electronics as well. For bringing our innovation out of the lab we have developed a strong go to market strategy divided into three different stages. STEP 2: 2018 BOOST: development of customers. STEP 3: 2019 SCALING UP: third stage foresees to start scalating globally by creating distribution channels with local hubs in non-European markets.